When you’re traveling for business, your hotel can make or break your experience. Choosing a business hotel is a personal choice, and if you make the right decision, your trip will be stress-free, relaxed and productive. Imagine waking up in the morning feeling like you’re home, free from your long commute and unnecessary hassles in your routine. A great business hotel can provide all that and more. Staying at Canterra provides all the comforts and conveniences of home. Your hotel suite will come equipped with a separate office, fully functional kitchen and in-suite laundry—perfect for corporate travellers who crave space to focus and take care of themselves. Prepare your own meals in your modern kitchen, stay productive in your private office with desk, and then unwind in your spacious master bedroom. Even if you’re thousands of miles from home, you’ll have everything you need to feel at ease. In addition to having your own separate office space, you can stay connected online with our free high-speed Wi-Fi. Reply to emails and send reports from your hotel suite and throughout the hotel. You’ll also have access to a printer should you need to print out documents and contracts. Be sure to contact our staff to make copies for you as needed. Canterra also offers a meeting room for business conferences and presentations. Our bright and spacious rental space is the perfect setting to conduct meetings for crowds of up to 60 people. For those who are landing in Edmonton by plane, Canterra offers access to the Edmonton International Airport Sky Shuttle (at an additional charge). Arrive at your downtown hotel suite safely and quickly, and then hop on the shuttle again for a fast, direct ride to your flight home. Driving your own vehicle? Or, perhaps you’re renting a car? At Canterra, you won’t have to worry about looking for a spot downtown, because we provide indoor and outdoor parking at our corporate hotel. Plus, for a limited time only, we’re offering our guests free outdoor parking, so be sure to unlock this exclusive deal while you still can. 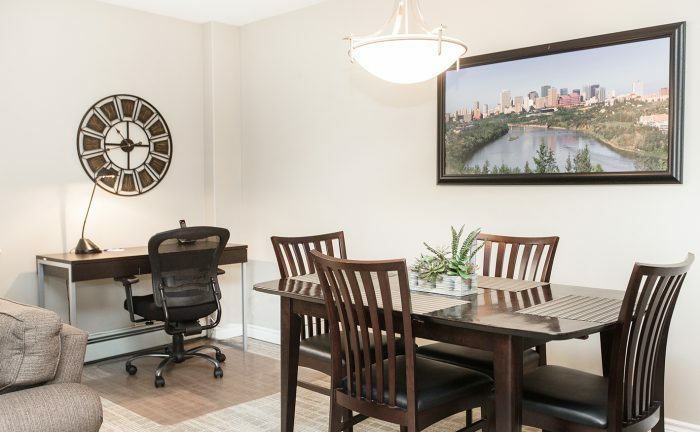 If you’re on a business trip to downtown Edmonton, Canterra Suites Hotel provides the comfort, space and privacy you need, all at a competitive corporate hotel rate. Contact us at 780 421 1212 or info@canterrasuites.com to book single or multiple office suites.